Te Wahipounamu - South West New Zealand is thought to contain some of the best modern representations of the original flora and fauna present in Gondwanaland. They include kiwis, ‘bush’ moas, carnivorous Powelliphanta land snails and the endangered takahe. 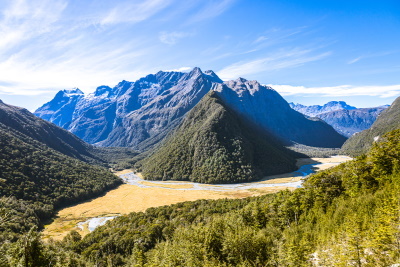 The area contains New Zealand’s highest mountains, longest glaciers, tallest forests, wildest rivers and gorges, most ruggesd coastline and deepest fiords and lakes. I visited Te Wahipounamu in July of 2007. Te Wahipounamu is the Maori word for what is the fjordlands area in the southwest corner of the South Island of New Zealand. This includes the famous Milford and Doubtful Sounds. I did a tour of Milford Sound and had the pleasure of going immediately after it had rained for 24-hours. Water was flowing down the sides of the fjord in hundreds of small waterfalls, and the large waterfalls were going at full flow. Visiting can usually be done on a day trip from Queenstown, but you can also stay in the region to do and experience more. Read more about Te Wahipounamu on my website. The hardest thing about this WHS is knowing where to start... and where to stop. It's not just enormous in terms of area, it has such an incredible amount of diversity. In some ways, it could easily be split into a few different World Heritage Sites, because each area has such unique aspects. As a visitor, I think the best thing is to hire a car and take your time driving along the coast over a number of days, stopping for different walks and viewpoints. 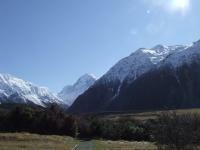 One of the highlights (for me) was the glaciers - particularly Fox and Franz Josef. The sad things is that they are receding so quickly at the moment. Part of that is just the natural ebb and flow but the human-caused climate change is also having a big effect. I wonder how long they will last. Will there be a generation soon that won't be able to see this?! As a local who has completed two full tours of the country, I have to say there is no other part which quite creates the sense of travelling into the prehistoric past the way Te Wahipounamu does. It's so simple to find a quiet spot where you can contemplate how little the landscape has changed here over the aeons, to get some perspective on how damaging the presence of humans is - and how important it is to ensure areas like this remain free of that damage. Then there is just the sheer, raw natural beauty of the place - it's a cliche to say it leaves me speechless, but that truly is the effect. Read more from Tom McSherry here. I was enraptured when I read the reviews already on this page. In April I made the 1000 km journey to the bottom of the South Island. This is the real New Zealand, far removed from the city life that I endure in Auckland. Most people travel to these remote areas by car, but if you are travelling alone, or feel that is too un-green, be assured that I toured the whole area from and back to Christchurch by local bus and train services. Because of the tortuous nature of the roads there I would recommend this as it allows you watch the scenery instead of the road. From Christchurch there are direct bus services to Te Anau, Queenstown, Mount Cook and Greymouth, as well as the scenic rail link to Greymouth that I used. From Te Anau there are several services to Milford which connect there with boat trips up the Sound. From Queenstown there are bus services to Te Anau (for Fiordland), to Glenorchy and Wanaka (for Mount Aspiring), to Fox and Franz Joseph Glaciers (for Westland) and onwards to Greymouth. 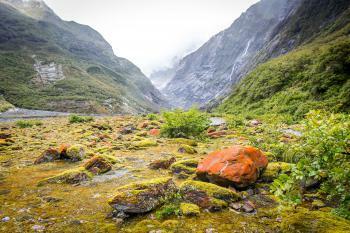 For the more energetic there are walks on the Milford and Routeburn tracks that lead through the Fiordland and Mount Aspiring National Parks respectively. Ah, New Zealand! I travelled for 3 1/2 weeks on both North and South Islands. Fiordland National Park is stunning but watch out for those keas (alpine parrots) that will tear their beaks into anything in their path, including your car! I took a boat tour on Milford Sound and felt like Jacques Cousteau. The waterfalls were beautiful and what a thrill it was to see seals on the rocks! On the boat, I went fishing for the first time with a makeshift rod that the boat crew gave me. Didn't catch any fish - just fed them with my bait! In a land of superlatives, Fiordland National Park earns the highest ranking possible in all around natural beauty. My jaw hurt from repetitive dropping as we made our way to scenic Milford Sound, passing through majestic glacier-topped mountains ringed with temperate rain forest. At Milford Sound, I suggest the boat tours, as the raging waterfalls, dolphin encounters and lazing seals are best seen from this vantage point. I have traveled extensively and I do not say this lightly when I call this area the most beautiful spot on earth. I am a bit surprised to see how many beautiful, world-class things Newzealanders have managed to "throw in one basket" with this monument. In fact Te Wahipounamu is quite big and extremely diverse natural area, and some other nations may be would make some five World Heritage sites out of it. 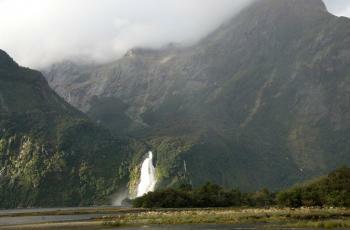 To me was a surprise to see so few people and so little development in Fiordland. Humans have managed to build here some prety good roads and some smaller cities and villages, but everything else is rugged mountains, dense coastal rainforest, incredible waterfalls, magnificent ocean - fairytale land (see "Lord of the Rings"). Beech Forests: Southern beech (a separate family from the other European / Asian beeches, but within the same Fagales order). Fatal Accidents or 'disasters': Fox Glacier in Westland National Park: Two Australian tourists were killed 8 January 2009 when more than 100 tonnes of ice fell on them. Nine people, including four international tourists, died in a plane crash 4 September 2010 when the plane, carrying a party of skydivers and tourists, crashed at the end of the runway at Fox Glacier Airport. Seven people, including the pilot, have been killed in a helicopter crash in Nov 2015. Covers more than 5% of country: Te Wahipounamu makes up 9,64% of New Zealand's area. Name changes: A complicated "morphing" of the name as part of boundary and other changes - so the 2 separate inscriptions from 1986 "The Westland and Mount Cook NP" and the "Fjordland NP" were subsumed within a new larger site which was called "SW NZ World Heritage area (Te Wahipounamu)" in the 1990 IUCN documentation but was officially inscribed as "Te Wahipounamu - SW NZ". This "final" name change to give precedence to the Maori aspects of the name occurred following comments made in the earlier Bureau meeting. 129 Community Members have visited.